Manchester School of Art has joined forces with Circle Square, a new city centre neighbourhood based at the former BBC site on Oxford Road, to create eye-catching street art. Circle Square and lecturers at Manchester School of Art teamed up and created a design brief for first year students, tasking them with the design of large-scale creative hoardings. The artwork will be implemented on the site hoardings that surround the 2.4 million sq. ft. plot based at the heart of Corridor Manchester, opposite the University. The campaign with Manchester School of Art features the core values of Circle Square, a joint venture between Bruntwood and Select Property Group, which includes architecture, greenery, community and collaboration. Unit X is an assessed part of students’ course enabling them to improve their professional aspirations by working in teams with students from other subjects on projects with industry professionals. The winning group, who worked collaboratively on the opposing themes of deconstruction and growth for their proposal, were; Jack Ramsay, BA (Hons) Graphic Design; Aine Curley BA (Hons) Graphic Design; and Amy Needham BA (Hons) Illustration with Animation (all pictured). The project is part of the University’s focus on employability and has given rising stars of the art and design world the chance to work on a real client project, learn how to work collaboratively and experience first-hand how real design and media teams operate. Amy was invited to work with Select’s creative team at their offices and Aine and Jack worked alongside Bruntwood’s digital marketing team. 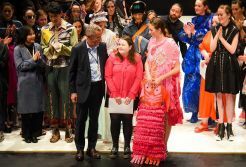 The winning hoarding design was created by a group of six students and developed by illustration student Amy Needham. Jack Ramsay and Aine Curley will work alongside the Circle Square social media team to deliver the social campaign over the coming weeks. 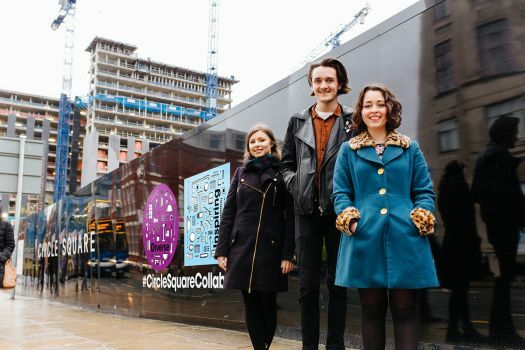 Ana Vieitez, marketing manager at Circle Square, said: “Our vision, as the city centre’s new neighbourhood, is to bring communities of forward-thinking people, creatives, businesses and students together. Our fantastic location at the heart of Corridor Manchester presents us with the opportunity to collaborate with a huge range of people and launch exciting projects that would not otherwise be possible. 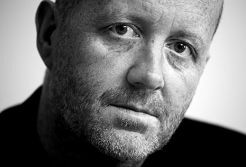 Ian Whadcock, Senior Lecturer at Manchester School of Art, added: “This open, experimental brief has encouraged the students to work together with the other artistic disciplines at the faculty, as well as teaching them how to conduct research, work with budgets and pitch to clients. A microsite featuring the work presented by each group will launch early next year and will display a selection of of Circle Square past and future collaborations.